As Franciscans in spirit, we give great thanks and praise for the life and example of our patroness, Saint Clare of Assisi. As Holy Week approaches, we join her in this litany composed and recited by her throughout her life in the cloister at San Damiano. 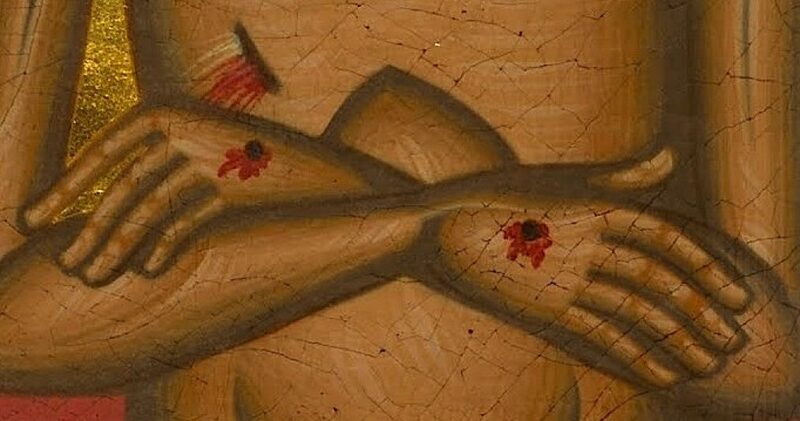 As we pray this litany in honor of the Five Wounds of Our Lord, we join in Saint Clare’s prayerful lament over the sufferings of our Savior, and we join in her hopeful prayer for the Lord’s love, mercy, and friendship. Saint Francis, pray for us! Saint Clare, pray for us! Our Lady of Angels, pray for us! Praise and honor be given You, Lord Jesus Christ, by reason of the of Sacred Wound in your Right Hand. By this holy and adorable wound, I beseech you to pardon all of the sins that I have committed by thought, word, and deed; by neglecting my service to you, and by self-indulgence, both while awake and asleep. Grant me the grace, that by devout and frequent remembrance of your Holy Passion, I may honor your sacred wounds and the death which you endured for my sake; and that by chastising my body, I may testify my gratitude for your sufferings and your death. Our Father. Hail Mary. Amen. Praise and honor be given You, Lord Jesus Christ, by reason of the Sacred Wound in your Left Hand. By this holy and adorable wound, I beseech you to have pity on me and to change within me whatever is displeasing to you. Grant me victory over your enemies, so that by the power of your grace, I may overcome them. And by your holy death, deliver me from all dangers, present and future, and make me worthy to share in the glory of your blessed kingdom. Our Father. Hail Mary. Amen. Praise and honor be given You, Lord Jesus Christ, by reason of the Sacred Wound in your Right Foot. By this holy and adorable wound, I beseech you to enable me to bring forth worthy fruits of penance for my sins. I humbly entreat you, for the sake of your holy death, to keep me safe, day and night, according to your holy will and to preserve me from all adversity, in body and soul, so that on the judgment day, I may obtain eternal joy. Our Father. Hail Mary. Amen. Praise and honor be given You, Lord Jesus Christ, by reason of the Sacred Wound in your Left Foot. By this holy and adorable wound, I beseech you to forgive my sins and to grant full remission for my sins, so that with your help, I may escape the rigors of your justice. I entreat you, Lord Jesus Christ, for the sake of your holy death, to grant that at the hour of my death, I may have the grace to confess my sins with perfect contrition; to receive the Blessed Sacrament of Your Body and Blood; and to receive the Sacrament of Holy Annointing for the sake of my eternal salvation. Our Father. Hail Mary. Amen. Praise and honor be given You, Lord Jesus Christ, by reason of the Sacred Wound in your Side. By this holy and adorable wound and by the Baptism with which you purified me from original sin, I beseech you to deliver me from all evils — past, present, and future. I entreat you, by your bitter death, to give me a lively faith, a firm hope, and perfect charity, so that I may love you with my whole heart, with my whole soul, and with all my strength. Uphold me by your grace through the practice of good works, so that I may serve you always in this life and praise you forever in heaven. Our Father. Hail Mary. Amen. and to praise and serve you forever and ever. We make this prayer through Christ Jesus, Our Lord. All Saints of Assisi, pray for us! For the twelfth consecutive year, Father Jim and Cliff Garvey will lead the Assisi Project’s week-long, small-group pilgrimage to Italy. From November 7th through November 16th, we will journey again to Assisi and literally walk in the footsteps of Saint Francis and Saint Clare. Each morning will begin with Morning Prayer and Mass. Father Jim will celebrate Masses at the Basilica of Saint Francis, the Basilica of Saint Clare, the Basilica of Our Lady of Angels, the Carceri Hermitage, and the Sanctuary at La Verna. Each afternoon, our pilgrims will have free time and guidance to explore Assisi at their own pace. Each evening, we will gather as a community for Evening Prayer, supper, a spiritual reflection, and faith sharing. As a fellowship of pilgrims, we will explore the Basilicas of Saint Francis and Saint Clare. Each of these blessed shrines contains the tombs of the saints, holy relics, historic frescoes, and other priceless works of art, along with quiet chapels for personal prayer and worship. We will also visit the Cathedral of Saint Rufinus, where Francis and Clare were baptized; the Church of Saint Damian, where Christ spoke to Francis and hastened his conversion; the hermitage, where Francis and his first followers retreated for solitude and silence; and the little chapelknown as the Porziuncola or “Little Portion”, which is considered the home church of the worldwide Franciscan community. We’re even planning a few surprises for this year! In addition, we will spend leisurely afternoons in and around the Piazza del Commune, Assisi’s city center, with its sidewalk cafes, unique shops, and ancient Roman temple (now a Roman Catholic Church consecrated to the Blessed Mother). Our more adventurous pilgrims will also have an opportunity to visit the Rocca Maggiore, the great medieval fortress with its stunning views of Assisi, Mount Subasio, and the Spoleto Valley. And finally, we will travel to La Verna, the mountain sanctuary in Tuscany, where Saint Francis received the stigmata. At La Verna, we will celebrate Mass, enjoy a traditional Tuscan lunch, and participate in the daily procession that commemorates how Francis received the five wounds of the Crucified Christ. The cost of this extraordinary pilgrimage is $3,499 per person which includes roundtrip air-fare and fees (from Boston Logan Airport); all ground transportation (except personal taxi service); eight nights accommodation (single room and private bathroom) at Casa Santa Brigida; and all meals in the guest house (breakfast, lunch, and supper). Prospective pilgrims should note that this pilgrimage is limited to just fourteen participants; involves some strenuous physical activity; and that access to some pilgrimage sites in Italy is limited for those with physical disabilities. For more information about the Assisi Project’s 12th Annual Fall Pilgrimage, please contact Cliff at cgarvey@assisiproject.com. Founded in 2007, the Assisi Project is a Fellowship of Franciscans in Spirit with members, friends, and followers in the United States, Canada, Europe, and Africa. We are dedicated to helping Christian believers of all ages to more faithfully live the Gospel of Christ in the spirit of Saints Francis and Clare. The Assisi Project is a non-profit, tax exempt charitable organization. All are welcome to support our ministry through smile.amazon.com or by sending your donation to the Assisi Project, Post Office Box 3158, Gloucester, Massachusetts 01931-3158. For more information about the Assisi Project and our upcoming opportunities for faith formation, prayer, and pilgrimage in the Franciscan spiritual tradition, please contact Cliff Garvey at cgarvey@assisiproject.com. May the Lord give you peace!